Not only is Jane a make-over magician, but also a style therapist. With her contagious enthusiasm, energy and extensive knowledge, she successfully helps clients identify and enjoy a personal look that works. Self-esteem and sense of worth are enhanced once clients feel that they are projecting an image which they are happy with. She considers proportion, personality, lifestyle as well as budget when putting together a unique, tailor-made look for each client. It is in this holistic approach that she manages to help clients build confidence and radiate increased positivity. 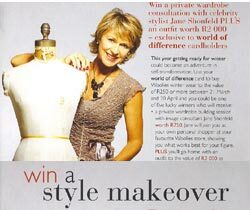 Jane teaches women that dressing well and feeling good about their appearance is within their reach.